The earliest known example of such a shell-shaped basket, on cast dolphin feet, is by Paul de Lamerie, now in the collection of the Philadelphia Museum of Art. A later example of 1747 is in the Farrer Collection, The Ashmolean Museum, Oxford, and was exhibited at the Victoria and Albert Museum, Rococo Art and Design in Hogarth's England, 1984, no. G21. In the catalogue entry Phillipa Glanville suggests that this design was perhaps inspired by earlier Meissen porcelain examples, which were being imported into London in the 1730s. She cites a scallop-shaped dish by Heroldt of circa 1728 with a painted diaper border which bears resemblance to the piercing on the Lamerie baskets (see Pantheon, XV, 1935, p. 203). 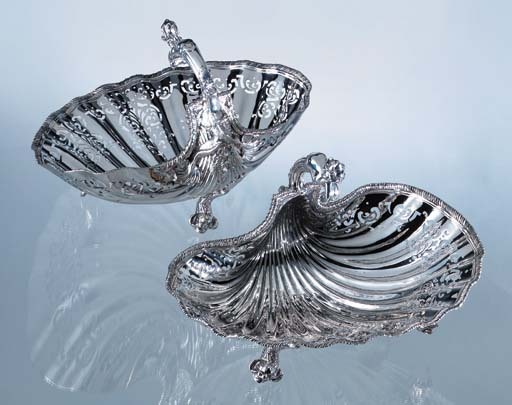 Moreover, French silver shell-shaped baskets are thought to have been produced after a design attributed to Thomas Germain, published by Diderot in Encyclopedie Planches, vol. 8, Orfèvres Grossier, Paris, 1771, fig. 5, pl. VI. Phillips Garden, Edward Wakelin, and Thomas Gilpin all produced baskets of this design in the 1740s and 1750s. (An example by Phillips Garden of 1752 was sold at Christie's, London, July 5, 2000, lot 7 and another of 1755 from the Reksten Collection was sold in the same Rooms, May 22, 1991, lot 48.) Only one other example by William Cripps is known; of 1755, it was sold at Christie's, New York, October 21, 1993, lot 544 (described in the catalogue as 1746).